El Pollo Loco goes for visual appeal with the debut of new Layered Avocado Salads, which feature ingredients layered in portable, clear bowls that you can shake to mix the salads. - Chicken Fajita Layered Salad - Chicken, avocado, fajita vegetables, cheddar cheese, black beans, pico de gallo, and lettuce blend. 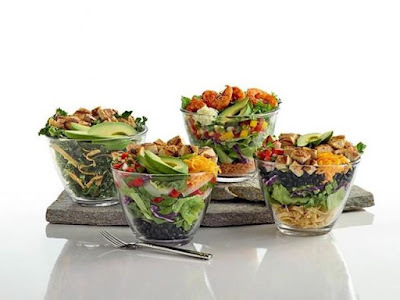 - Double Chicken California Layered Salad - A double helping of chicken plus avocado, cheddar cheese, black beans, tortilla strips, pico de gallo, and lettuce blend. - Shrimp Mango Avocado Layered Salad - Shrimp, avocado, mango salsa, cotija, rice, cilantro, and lettuce blend. - Tossed Chicken Kale Caesar Layered Salad - Chicken, avocado, kale, cotija, tortilla strips, and lettuce blend tossed in Caesar dressing.